I am looking to make an isolated power supply to replace my current 'daisy chain' setup. Locally sourced (240ish v ac) transformers are relatively expensive- around 22 bux for a dual 9v tap or 7-8 bux for single tap 9v. i want to make an 8 outlet supply and so the cost blows out very quickly into the realms of -'just go buy one' territory. idea #1: As a cost saving attempt my first idea i have considered is using a 2 amp transformer (out of the wall wart that i already have) and running multiple instances of the ggg circuit , from the bridge rectifier onwards, all off the one transformer tap.... I dont know if this will work as a means of isolation to prevent ground loops or not? will it work? While i am pondering this i start cursing the prices of transformers at my local retail electronics store (because deep down i suspect that my single transformer solution wont do what i want it to) i think- " if that tranformer is worth 7 bucks then how can a hong kong company on ebay put one in a wall-wart and sell it to me with cable , case, components and everything posted to my door for 4?"..... it took about 10 minutes for this to sink in...... but when it did i realised how i could save a few dollars on my transformers. If my first idea would work, that would be ideal for me because i could start it straight away, failing that i guess i have a 2 to 6 week wait on postage from hong kong. 240v? Guessing your in Europe. Doubt you'll build one this cheap. Bought one a few months ago and was well pleased. are try to building something like v.labs pp2+ ? i think its hard to source 8-in-1 toroid transformer..unless the pedal board is exceptionally big..i'd go for 2 or 3 channel output of 9 or 18v.. Thanks for your replies, they have helped me think through how to do this. I have found some cheap 9v wall wart power supplies ( $2 each x 8 )and set them up with the filter /regulator section of the spyder /ggg circuits-( on the assumption that they do not have adequate ones already installed- i will have to wait and check). The only difference between the two circuits seems to be the value of the second capacitor used. the spyder circuit uses 10uf and the ggg circuit 100uf. Iam guessing that either would work just as well as the other? actually, looking at it again i am guessing that the spyder one is different because the circuit has set the voltage at 9v by labeling the 78L09 where as the ggg circuit has left it as 78Lxx dependent on voltage chosen. maybe it makes a difference ? I think im going to side with the spyder and go with 10uf. Is there any advantage to having a higher voltage supply that is filtered down to 9v rather than a 9v transformer? the ampage is already sufficient so i don't need to make any gains there..... Maybe its a 'headroom' thing? oldrenegade wrote: 240v? Guessing your in Europe. Doubt you'll build one this cheap. Bought one a few months ago and was well pleased. Australia, so postage would kill me! but yeah that actually looks like a good deal. imnotgay wrote: are try to building something like v.labs pp2+ ? i think its hard to source 8-in-1 toroid transformer..unless the pedal board is exceptionally big..i'd go for 2 or 3 channel output of 9 or 18v..
and 18v option for the third channel..
and as for the voltage regulator (7809) vs 9v transformer, its all about noise..the 78L09/78xx is a regulator and a transformer output depends on the input..but the voltage regulator needs around 2v extra + the output voltage for input..as for the ampage a good choice is go for 7809(1A) as the 78L09 is 100mA..
as for the capacitor choice..bigger is better..
if I go with the top board it'll mean i stripped the transformers out without any of the rest of the circuit.- in this case the transformer will need mounting on the board too possibly. 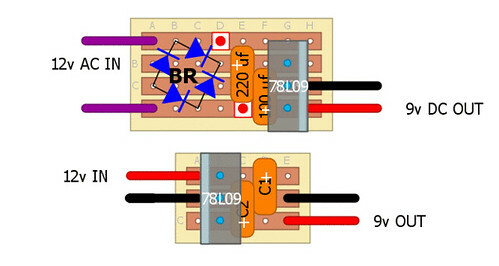 The bridge rectifier can be made to take up less space and the top ac lead in can be dropped down if needed which would save some space if needed- it just makes it harder to see whats going on in the layout diagram though. Also- thinking through my initial idea of just running back as far as the AC but using the same transformer- I think i was somewhat confused about the difference between an "earth" and a "ground" ... Am i right in thinking that AC is like an alternating ground? and following that through- that i could still get ground loops off of it? I am thinking so, but even though this sort of makes sense the whole thing is a bit fuzzy to me. more research needed i guess to get my head around it. Take a look at a 4 pin dip rectifier, it may fit nicely on the vero and be more compact. (It's basically the 4 diodes crammed in to this package). You want to separate/isolate the grounds between the 115VAC and the other side of the transformer which will be your pedal ground.